Harold Septimus Power was a New Zealand-born Australian artist and an official war artist for Australia in World War I.
Harold Septimus Power (31 December 1877 – 3 January 1951) was a New Zealand-born Australian artist, who was an official war artist for Australia in World War I.
Harold Septimus Power was born in Dunedin, New Zealand in 1878, but his arrival date in Australia is unknown. 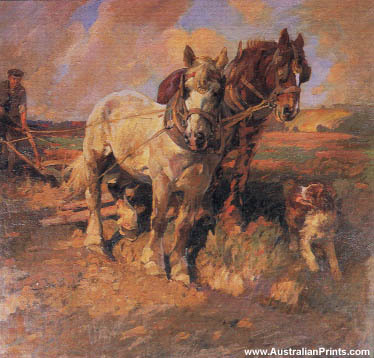 He was described as a ‘practically self-taught artist’ and he exhibited first with the Melbourne Art Club at the age of 17 before settling in Adelaide in 1898. He is known to have made special studies of the anatomy of the horse and these were the basis of his subsequent great success and wide popularity. After study in Paris he settled in London, became a member of the Royal Institution of Painters in Oil and Society of Animal Painters, exhibited at the RA and served as an official war artist with the ATF during World War 1. Most of his war painting pertained to cavalry engagements. His commissioned work included the ‘Opening of Federal Parliament House, Canberra by HRH The Duke of York, 1927’ (outside ceremony), and three huge panels entitled ‘War’ for the stairwell of the Melbourne Public Library, 1924. Artist information page for Harold Power. This article uses material from the Wikipedia article Harold Power, which is released under the Creative Commons Attribution-Share-Alike License 3.0.